Do you find yourself asking meeting participants to repeat themselves because the audio quality isn’t crystal clear? Have you ever accidentally ended an important call by hanging up instead of selecting mute? Audio conferencing has evolved and it’s time to eliminate these time and productivity-wasters. 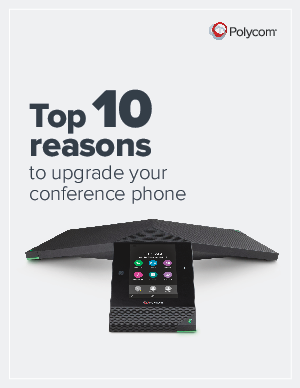 Check out this list of top 10 reasons to upgrade your conference phone and see and learn all about the newest star on the conference table, Polycom Trio.